How We Discovered This Book: We found this book in the holiday books bin at the library. Summary: Multiple parts of an extended family are invited to Grandma’s (and Grandpa’s) for the holidays. All of the families make their way there through different forms of transportation. All with pies for Grandma! What the Kids Liked About This Book: Elizabeth liked seeing all of the different families and what they do on Christmas. Plus she will take any excuse to make me sing along with a book. If you’re a teacher and are looking for some classroom activities that involve the traditional lyrics in text, check out Scholastic’s site. Where do you go for the holidays? Do you go to Grandma’s house? Or does she come to you? Brainstorm the different ways that you could travel…. both the traditional (by car, bus, train, etc. ), and the slightly silly (by snail, in a handstand, on a cat doing a split)! Take a walk in a park or woods near you… what is it like to go over the river and through the woods? What do you notice along the way? Max is back with his review of Over the River and Through the Wood: A Holiday Adventure. Max would love to hear your suggestions on picture books he should review. Please share your suggestions in the comments! How We Discovered This Book: This is an ALA Award winner of the Caldecott Award in 2017. Congratulations! Whenever I need some new quality books to read, I check out the ALA Award winners. There is a high probability that I will like the books they select. Summary: A cat explores the world and encounters a child, other animals, and bugs. The author/illustrator then shows us what each of them see when they see the cat. He uses mixed medium to show a different view of the cat each time. While it’s very enjoyable for a child visually and audibly (spare, lovely prose), adults will be interested in the underlying thoughts, perspectives, and assumptions that go into each view. What the Kids Liked About This Book: Both of my kids enjoyed the contrasts in images, words, and ideas. It caused some interesting discussion between them after reading. Grab a group of friends or family and make your own paintings or drawings of what you see around you (preferably outdoors after a walk/hike!). Hang up your pictures gallery style, and compare and contrast what you each saw. Talk about how animals might see us. Watch this video on How Animals See the World. Here are some activities and coloring pages from the publisher. Enjoy! Max is back with his review of They All Saw a Cat. Max would love to hear your suggestions on picture books he should review. Please share your suggestions in the comments! How We Discovered This Book: This is another great find from the new books bin at our library. My daughter was immediately interested based on the cover art. Summary: Leonard takes a shortcut through the park and finds a dinosaur egg. It hatches, and together they go to many places across the city. But then the dinosaur gets too big for Leonard’s apartment. What I Liked: The illustrations are rendered in charcoal and then colored on the computer. They are simple but expressive, which gives the look a Calvin and Hobbes-type vibe. The story is fanciful, but not ridiculous – the right words along with regular expressions on the boy’s face make you believe it could really be happening. By the end you believe it has all happened. Or has it? What Did My Kids Think? They liked going along with Leonard’s imagination, and that the story takes an unexpected turn at the end. They liked the cute illustrations, and the fact that the dinosaur stays cute even as he gets bigger and bigger. Both enjoyed reading this book over and over. Make a paper dinosaur and take him/her places. Take pictures to chronicle your adventures. Do you go the same way to school, the park, or other favorite place? Try a different route next time, and see what you might discover. Hello from Max! Max enjoyed this book too – see what he has to say. How We Discovered This Book: My daughter’s teacher read this book to her class, and she hasn’t stopped talking about it since. Summary: From the beginning: “You might think a book with no pictures seems boring and serious. Except… here’s how books work.” The book continues with the reader having to read all kinds of silly things aloud. What I Liked: It’s a creative approach, and the silliness makes it fun to read multiple times. And the children will want you to read it again. And again. What Did My Daughter Think? This books makes my daughter laugh EVERY time. I think each time we read it she laughs harder, anticipating what is coming next. She’s even made up a tune to go with the words. 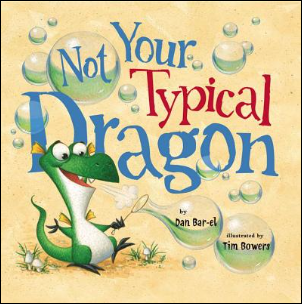 Look for other books that are especially fun to read aloud. Try We Are in a Book by Mo Willems or Press Here by Hervé Tullet. Watch author B.J. Novak read the book aloud to a group of kids. Max is back with his review of The Book with No Pictures. Max would love to hear your suggestions on picture books he should review. Please share your suggestions in the comments! How We Discovered This Book: We found this one in the new books bin at our library. The cover and illustrations pulled me right in. It has received 4 starred reviews, an Ezra Jack Keats New Writer Honor, and a Charlotte Zolotow Honor. Summary: Sophie finds a lovely squash at the farmer’s market, and draws a face on it. She names it Bernice, and it becomes her best friend until her family and friends becomes concerned that Bernice is…. well… rotting. When Sophie finally does what’s best for Bernice, she is rewarded for her dedication. 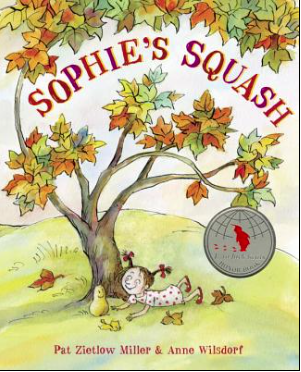 What I Liked: How Sophie adopts a squash and makes it into a friend is totally something my daughter would do. I love Sophie’s spirit, and how she has her own mind about things. What Did My Kids Think? They liked the dialogue, and how Sophie handled the questions from her friends and family. Aidan’s favorite part was when Sophie’s mom suggested that Bernice would be tasty with marshmallows, and Sophie responded, “Don’t listen Bernice!” Sophie also says that the blotches that Bernice gets are really freckles. Random House has a few activities, including how to host a Sophie’s Squash story time, and how to make your own fall friend! Make your own friend from a fruit or vegetable. Get creative- all you need is a Sharpie and your favorite friend. Penny Klosterman reviewed this book back in 2013 on her blog– check out her review and her activity ideas. Max has his own thoughts about Sophie’s Squash, and what makes the best fall friend. Check out his review below, and the rest of his reviews at Puppets Love Children’s Books. How We Discovered This Book: We found this one in the new books bin at our library. Summary: Elmore’s life is perfect- he puts his toys where he wants, and he’s in sole control of his jelly beans. Then his new brother comes along. And he is no fun at all. Maybe. 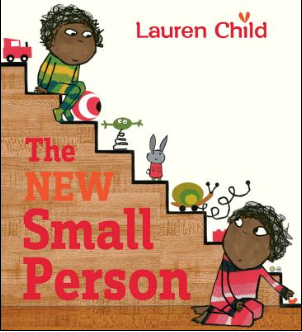 What I Liked: Besides the totally charming illustrations (similar to Ms. Child’s Charlie and Lola characters), this is an interesting take on the changes that first borns have to deal with when a new sibling is born. What Did My Kids Think? They love Charlie and Lola, so they liked this book right from the cover. Aidan said he didn’t feel this way when his sister came along, but he was very eager to play with her. Check out Creative with Kids for playtime activities for babies and older siblings. Interested in checking out Charlie and Lola? They have a website with activities and more information about the books. They even have a TV show on PBS. Hello from Max! Max really liked this book too – see what he has to say. How We Discovered This Book: I went looking for a summer themed book, and this is one of our old favorites. It is also a Theodore Geisel Award winner. Summary: Piggie and Gerald can’t wait to play outside, but it begins to rain. Gerald helps Piggie have fun in the rain, but then it stops. What will they do now? What I Liked: The Elephant and Piggie books are charming, simple, and funny. This book is no exception. With just simple illustrations and text, so much is expressed. My kids and I just noticed (after many years of reading these books) that the setting is just some nondescript place outside. We had never noticed! What Did My Kids Think? My kids vie for who gets to read each of the voices. The text leaves so much room for expression. The books are short reads, so there is plenty of time to go back to the beginning and read it again! Brainstorm with your kids/students a list of things you can do inside and outside. And then flip the list and talk about what would happen if you had to do an outside activity inside (and vice versa). What creative solutions could you come up with to make each activity work? There are many possible Elephant and Piggie companion activities: Try these or these. Mo Willem’s Pigeon even has an Elephant and Piggie party kit! And heeeeere’s Max! 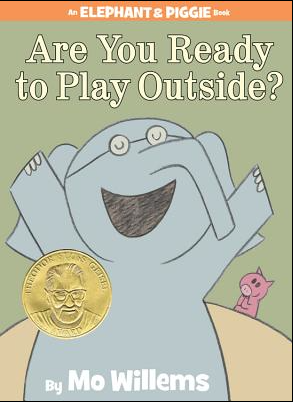 He’s back with his own review of Are You Ready to Play Outside? Max has taken a break from hanging out at the pool to give us his review this week. Max is back! See what Max thinks of this month’s book. Summary: Hermelin is a mouse living in a little girl’s attic on Offley Street. Things go missing, and Hermelin decides to play detective and find their things. As he solves the mysteries, he leaves notes for the owners to tell them where to find their belongings. 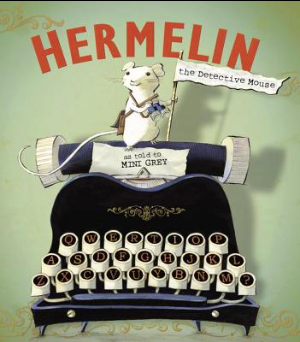 What would people think if they knew that Hermelin was a mouse? What I Liked: Hermelin is cute, and the author/illustrator gives him a lot of personality. The illustrations are so rich, you can linger on each page just looking for all of the hidden details. I love that he names himself after a brand of cheese, rather than something like Bob or Squeaky. What Did My Kids Think? My kids loved trying to solve the mysteries, and felt very smart when they figured them out. As soon as we were done reading, they immediately wanted to go back and read it again. Type secret notes for a friend or family member. Hermelin uses a typewriter, but a computer and printer will do. You could find something they’ve been missing, or do an act of kindness. Imagine you are a mouse. Get down on the floor and discover what you might find if you are at Hermelin’s level. Summary: Red is on her way to Grandma’s house as you would expect, but how would the story be different if Red and the Wolf had taken ninja lessons? (And Grandma had taken tai chi). What I Liked: This is a fun twist on a traditional fairytale. Each time you think you know what to expect the author throws you something unexpected. What Did My Kids Think? I have a son who thinks ninjas are cool, and a daughter currently taking karate lessons. What’s not to love? Last month we introduced you to Max, a new contributor to our blog. He has his own YouTube Channel called Puppets Love Children’s Books. We’ve asked him to stop by every so often to give us his own unique perspective on picture books. 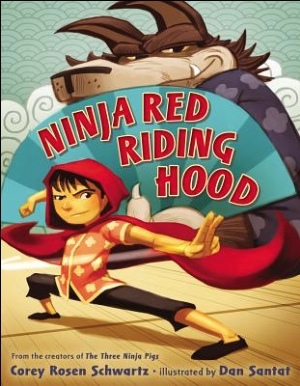 Check out what Max has to say about Ninja Red Riding Hood. Review: Not Your Typical Dragon/ Introducing Max! How We Discovered This Book: This book was an Imagination Library selection. The Imagination Library is such a wonderful program, and I am sad that just this month my daughter received her last book from the program (it ends at age 5). Summary: A small dragon names Crispin turns 7, and is expected to breathe fire. But things work a little differently for Crispin – he breathes other things like beach balls and marshmallows. His parents are aghast, but Crispin eventually finds his way with the help of a friendly knight. Crispin’s unique talents come in handy when a problem threatens his family home. What I Liked: Both the text and illustrations are so whimsical, and you are rewarded with something new to notice each time you read it. The author has provided some good thoughts about embracing your differences, but he does it with subtlety and humor. What Did My Kids Think? My kids loved the illustrations – especially when Crispin breathes funny things. They couldn’t wait to turn the page to see what Crispin did next. They were very happy for him at the end of the story. This book is on frequent rotation at my house. ReadWriteThink has some companion activities for young children, working with each of the items Crispin breathes. Activity Village has dragon-themed crafts, activities, and printables… even a video for making a dragon’s head from origami. I’ll have to try the dragon made from egg cartons. Haven’t seen the movie How to Train Your Dragon or its sequel? Now might be the time! Today we’d like to introduce you to a new contributor to the blog. His name is Max, and he has his own YouTube Channel called Puppets Love Children’s Books. We’ve asked him to stop by every so often to give us his own unique perspective on picture books. Max loves reading children’s books, watching movies, and hanging out with his friends. His favorite books make him laugh, or surprise him. Gather up your kids, grandkids, or the young at heart, and see what Max has to say!